This upcoming weekend, me and my wife are headed on another road trip from Southern California to San Francisco to attend a small family reunion (with my wife’s family). There were many hotel options to choose from and one factor that was important to me was whether we could book our hotel stay for free. After some google searching, we decided to use some Starpoints to cover our stay at the Four Points by Sheraton San Francisco Bay Bridge. Some benefits include parking, free morning coffee, and free high speed wireless internet access. Whenever a vendor takes American Express, we like to use our Starwood Preferred Guest credit card to earn Starpoints on our purchase. Starpoints can be extremely valuable at up to 2 to 4 cents per point. 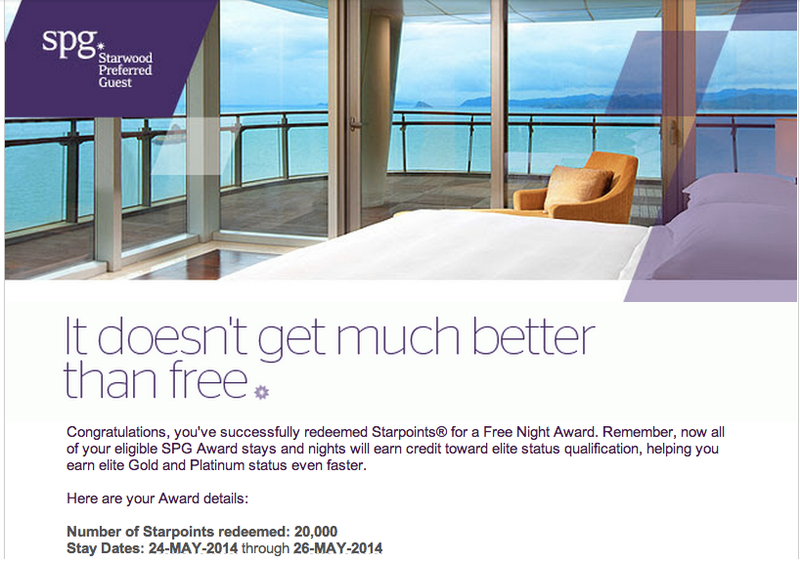 It’s easy to redeem Starpoints for free hotel stays. Simply go to www.spg.com to look up hotel options by location and travel dates. The Four Points hotel had a rate of $139 each night. This is an SPG category 4 hotel, which means that 10,000 Starpoints can be redeemed for each night. If we were to book 2 nights with cash, we would be spending $278 ($139 x 2). Instead of paying for the hotel with cash, we are redeeming 20,000 Starpoints for a free hotel stay and saving $278. This redemption gives us a Starpoint value of 1.4 cents. This really isn’t the best use of Starpoints; however, it’s okay because we are not trying to hoard any points right now. It’s nice to have a surplus of Starpoints. I love staying at hotels for free! I'm heading to NYC next week for a wedding and I'll be staying at the Andaz 5th Ave. over the weekend for a grand total of $0. Awesome! I'm glad to hear that you are using points to pay for your hotel stay! Enjoy your trip.